Winter has flowed in (or, more precisely, flooded in) with atmospheric rivers. While the variety of produce now is not as wide as at other times of the year, we can always count on dark leafy greens: Swiss chard, kale and collard greens are versatile, good and good for us. My love for Swiss chard dates back to my childhood. 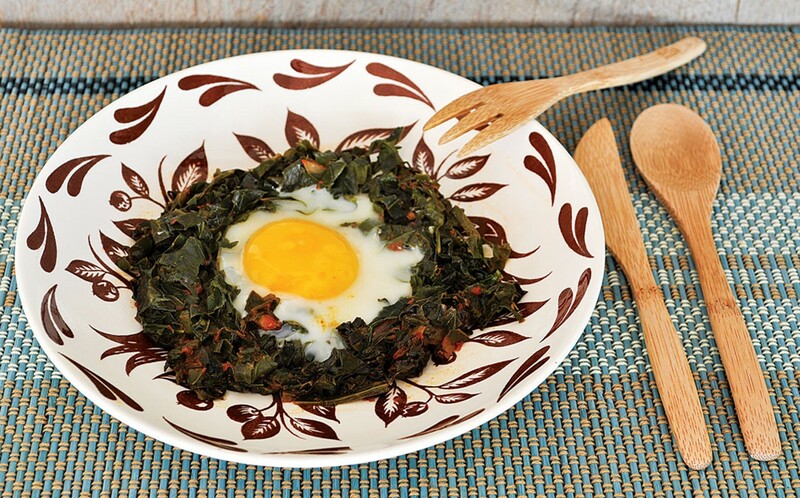 After I moved to California, I easily incorporated various types of kale and collard greens in my diet. Tuscan kale, aka, lacinato kale and dinosaur kale, is called cavolo nero in Tuscany; my mother never prepared it, so I met it only after I arrived on this side of the world. Years ago I planted some red Russian kale in my serendipitous garden and let a couple of plants go to seed. I continued the practice and kale grows wherever I spread my compost. . Something similar happened with collard greens. Both plants (varieties of Brassica oleracea) require little care and are generous producers, hence they are ideal for novice gardeners. My inclusive taste was not shared within the family and often I found myself alone in consuming the delicious dark vegetables. I did not let a lukewarm reception from my husband deter me and tried different ways of preparing them until I found one that united us in approval. A trick that usually works with him is "just add tomatoes," in this case, some tomato sauce. In midsummer, I spend a fair amount of time roasting and straining tomatoes that I then freeze for use during the months when farm-fresh tomatoes become a memory. I described the recipe for this in an earlier article ("Tomatoes as Comfort Food," Oct. 6, 2011). I understand this is of little use right now but if you bookmark it, it will become handy next summer, when flats of juicy tomatoes become available. You may preserve tomatoes and have your own recipe for tomato sauce, or use a favorite brand of tomato sauce. Either way, just keep it simple in terms of additional ingredients. The nice thing about this recipe is that it can be made in steps. I cook dark leafy greens as soon as possible after purchase or harvest, then store them in the refrigerator. I make tomato sauce often enough that I always have some on hand and eggs from pastured poultry are permanent staples of my refrigerator. The final step of putting together the ingredients only takes a short time. As I've mentioned before, my husband is making his own space in the kitchen so I will tell you not only how I like to finish the dish, but also the way he does. We are not in competition. If you don't have a kitchen scale, treat yourself to one that shows both grams and ounces — they're small, inexpensive and a great help. Wash the greens and separate the leaves from the stems. There are various ways of doing it. I hold the end of the stem with my left hand and place the index and thumb of my right hand around the stem where the leaf starts, then pull the fingers along the stem, separating the leaf from it. You can also fold each leaf in half and slice away the stem. 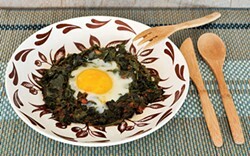 Set aside the chard stems and make something with them, like a gratin ("Charmed by Chard," June 9, 2011). Make a chiffonade: start with a stack of four to five leaves and roll it tightly starting from the base of the leaves. Hold the roll with one hand and with the other cut thin slices across. Repeat with the rest of the leaves. Place the pile of cut greens in a large skillet and cook them in the water they hold until wilted (about 3 minutes), then cover the skillet and cook on gentle heat until the greens are tender, 7-8 minutes. Stir every couple of minutes. Add a bit of water as needed to prevent sticking. Salt to taste. At this point you can continue with the recipe or let the greens cool and store them in a cover container in the refrigerator for a day or two. 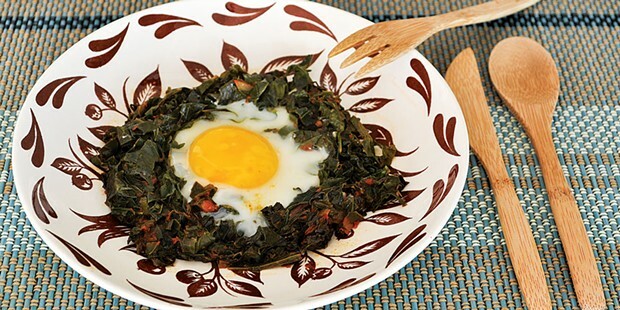 When ready, take a portion of the greens per person to serve and either cook them all together in a larger skillet or make individual portions in smaller ones: 2 ounces of cooked greens per egg is the amount I use. Prepare only what you will consume. Oil the skillet well and warm up the greens. Add 2 tablespoons of tomato sauce for 2 ounces of greens and stir well. At this point you can follow the egg path. To prepare the dish with eggs: When everything is nice and hot, spread the greens evenly and make an indentation for each egg. Break an egg into each indentation and cook on low heat until the white is set and the yolk is cooked to your liking (in my case, runny). Sprinkle a tiny amount of salt on each egg. My husband prefers to skip the eggs and use the greens as a side dish, so when everything is nice and hot, he drops a dollop of butter on top, letting it melt and spread through.